Mountains: I don’t think I’ve ever been up a mountain. I’ve not even been up many hills. And when I did go wandering around the great outdoors the last thing I wanted to do was talk to complete strangers. I have an old poem from when I was about fifteen called ‘The Curse of the Summer Saturday’ in which I complain from one end of the poem to the next about all these people who’ve invaded my beach. We lived close to the beach growing up and I was always to be found there wandering round on my own thinking great thoughts. Memories: When my mum died I got the job of divvying up the family photos. My siblings and I sat in Mum’s living room and went through every single photo. If more than one of us wanted a photo I scribbled our initials on the back and when Carrie and I got home she scanned them and I posted packs out to my brother and sister. It was an interesting exercise. I knew which photos mattered to me but I was surprised to see which photos mattered to them especially when they asked for copies of photos of me. That was the day the last photo of the three of us was taken. As far as smiling goes very few photos exist with me smiling. I stopped when I was about ten, quite deliberately. When my daughter passed her degree last year I bought a new suit and paid for a photographer to take a picture of the two of us. In two I’m smiling and it’s one of those I’ve framed in my hall. A real fluke. The photo of me on Facebook is from that session. I just cropped out my daughter. Needless to say I’m not smiling in that one. 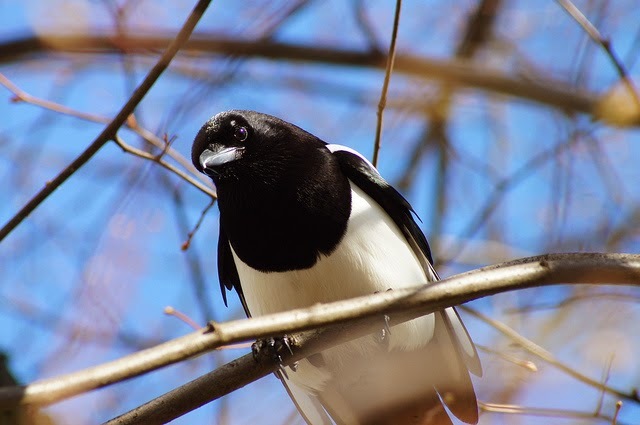 Magpies: There’re magpies all around here. Rarely do I look out a window and not see one or two. It was a magpie that brought our cockatiel to us. Carrie heard this kerfuffle at the window and there was a dirty great magpie attacking a cockatiel. She opened the window, shooed off the attacker and somehow coaxed Birdie in with a bit of lettuce which amuses me because he’d turn his beak up if you tried to offer him anything like that but I guess he must’ve been starving. I’ve no idea where he came from, if he escaped or if he was ejected but he landed on his feet with us. That was on 7/7/05, the day of the London bombings which means he’s been with us for nine years. They can live for anything up to twenty-five years in captivity and according to his anklet he was born in 1996 which makes him eighteen so I expect he’ll be around for a wee while yet.